Former FBLA member and business student, Josh Buttenhoff, continues to shine brighter and brighter! Josh was one of FBLA adviser and business teacher Lisa Smith’s students at Northwest Whitfield. During his time in FBLA, he became Smith’s first national winner, competing in Global Business. After high school, he went on to pursue a business degree at a prestigious business school in London. Buttenhoff visited Smith and her classes to share with students how he paved his road to success. “Pay it forward,” he said! He landed his dream job and moved to Dubai on March 10 to advise companies on Mergers and Acquisitions as an Investment Banker. He spent his last day in the States talking to Smith’s senior homeroom advisees, FBLA and FFA officers, and advanced class. It means so much to Smith to know that those whom she has influenced are achieving such amazing things. Now he is sharing what he has learned about the world and achieving success. His next business venture and perusal of achievement awaits! Good luck Josh and keep making everyone proud! Mikayla Whitfield of Sonoraville High School was recognized as the Calhoun Woman’s Club Youth of the Month for the month of April. Lisa Smith, her nominating teacher and FBLA adviser nominated Mikayla for this award based on her performance all four years in her business classes and for Mikayla’s leadership in Future Business Leaders of America (FBLA). 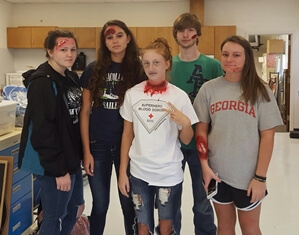 In order to help prevent students from making bad decisions on prom night, FBLA members from Bremen High School team up with local law enforcement to put on a mock wreck. Students were in shock and awe when they saw their fellow classmates in a (staged) fatal car wreck. Afterwards local law enforcement and med-e-vac pilots spoke to the students about how their safety is the most important thing. Special thanks to the students and law enforcement involved! Interested in contributing to the Georgia FBLA blog? Write an article about your chapter and you might be featured on our site!